Now my initial impressions (not necessarily Abby's) of Asheville from afar was that it was this hipster enclave where everything revolved around either craft beer or hiking in the Blue Ridge Mountains. We certainly came to appreciate both of those, but got the chance to also experience so much more of what this eclectic and artsy city has to offer. ~Asheville is definitely a special kind of "hipster", mountains, beards, beer, and bicycles are plentiful! The landscape is gorgeous though and so different from anywhere I've ever lived, so I liked the change of scenery. It's hard to beat the drive into the city as once you hit the Blue Ridge Parkway, the mountains seem to engulf the road around you. It truly is a scenic drive. 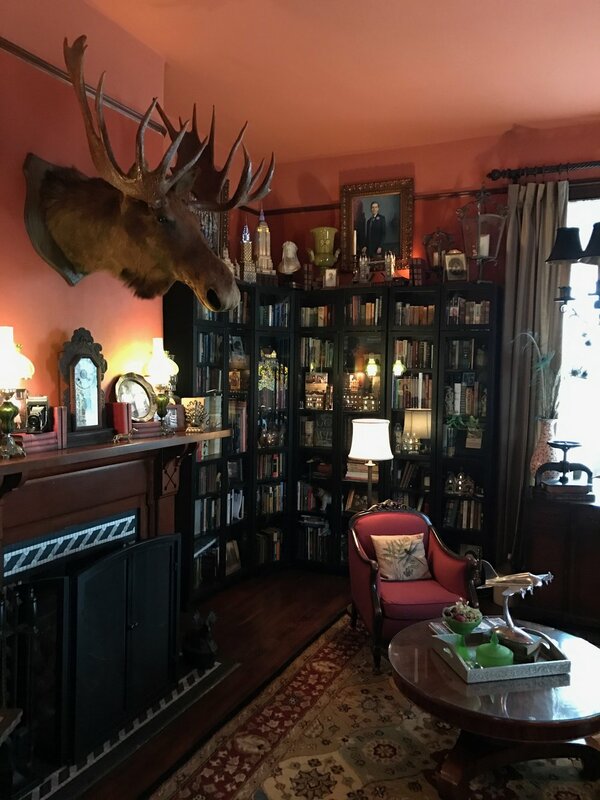 After a considerable amount of research (mostly on Abby's behalf), we booked our stay at The Reynolds Mansion, a gorgeous and historic bed and breakfast. The home itself dates back to 1847 and derives it's name from Reynolds family who owned and operated the home up until the 1960's. An interested fact we learned was that Robert Rice Reynolds' (also a US Senator in the 1930's) 5th wife, Evelyn Washington McLean, was the owner of the famous Hope Diamond. While it resides in the Smithsonian now, you can imagine it displayed on her neck for all to see at the many parties and gatherings the property once hosted. ~I loved the Reynolds Mansion and can't recommend it more highly! Perfect location, friendly staff, and so much character in every nook and cranny of the mansion. I loved the clawfoot tub, the fireplace in our room, the free wine, the decadent breakfast spread, the gardens, and the double wrap around porches. I really never needed to leave. As we got into the city we headed straight for downtown (a man's got to eat you know) and right to the hailed Farm Burger. After adequately filling ourselves up, we decided to stroll the downtown area. The shops and restaurants peppered throughout the area all had a very unique and local centric flair to them. One aspect not to be missed is the street performers. Now we've been to cities all over the place but have rarely seen as talented and diverse a collection as Asheville had to offer. There were bluegrass bands young and old, a saxophone player or two, the obvious 20 something acoustic guitar player (more like one every corner), a man with a keyboard, a couple of guys playing buckets, as well as several confident singers spread across the area who needed no instrumental backup and went for belting it out right there and then (insert Whitney Houston/Frank Sinatra/Justin Beiber song at your leisure). ~ I like bluegrass music (I even have a banjo that I'm slowwwwwwly learning how to play.) And so my favorite part about downtown was all the musical acts on every corner. It's just really impressive to me. Some of the shops were interesting, but nothing really caught my eye this trip. We didn't spend a lot of time downtown so it definitely deserves another visit! After an hour or two strolling the downtown, we went to check into our bed and breakfast and kick our feet up for a bit. While there are several rooms to choose from in the Mansion, each with different offerings, we chose the Katie Room (Abby took one look at the clawfoot tub and fireplace and the choice was made). The property itself is set on 4 acres and has its own chickens and bees, which really adds to the comforting ambiance. Not to mention the two rap around porches, the side garden, the pool, and the countless rocking chairs and porch swings. All combine to make you feel right at home. The complimentary wine fridge also helps! That first night we booked a reservation at Bouchon, a small French bistro serving delicious comfort food (guys, get the steak au poivre and garlic herb fries). While we waited for the table to be ready we went to The Battery Park Book Exchange and Champaign Bar. Now Abby and I never need an excuse to spend hours in a bookstore perusing each and every aisle for hours at a time, but then you throw in a champagne bar as well... sold, game over, this is where I'll be the rest of the weekend. ~I LOVED Bouchon. The fries with red pepper aioli and chocolate mousse were stand outs. The Champagne book store was also right up my alley. Listening to live music, sipping my bellini, and perusing the upstairs gardening section made our 1+ hour wait for a table at Bouchon so enjoyable! The next morning we had a fantastic breakfast at the Reynolds Mansion, 9am sharp. All of the guests gather in the ornate dining room, decorated floor to ceiling as it seemingly was 100's of years ago. While we all dined on the most delicious spread of grits and bacon and eggs, Billy (the owner) would lounge at the head of the table and play conversational conductor, igniting and fueling multiple conversations at once with a room fool of complete strangers from all over the country. This human element of connection and interest is what we genuinely loved about our stay there. ~ Billy has a lot of great stories about guests who have stayed at the Reynolds Mansion. Lady Mary from Downton Abbey has stayed there a few times and Alison Krauss. It was even short listed for Obama to stay there when they visited Asheville, but lost out to the famous Grove Park Inn. Billy is such a treat to meet and he really is adding to this history of the property. ~While we didn't buy anything this trip, I was impressed with the price points. How often can you get original artwork and meet the artist for a pretty affordable price? Everything we saw would be an immediate conversation starter in any home. Abby in her Asheville uniform of yoga pants, Patagonia, baseball cap, and Raybans. I just need some real hiking boots. I (being the beer lover) also suggest taking the tour at the newly built New Belgium Brewery, which sits right along the French Broad River. There's tastings of several of their beers and tons of cool information as they take you through the whole process. It's also a great place to hang out with friends as they have a good size tasting room (food trucks outside) as well as a huge green space to hang out (people bring frisbees, corn hole, their dogs). ~I don't like beer, but I did enjoy the tour! They have such a cool company culture and take such pride in every detail of their work, staff, and the community around them. As we developed quite the appetite after the walking and beer tasting (I was tasting for two as Abby kept having me finish each glass), we headed over to Biscuit Head for lunch. Now if you're going to eat at one place and one place only in Asheville, it has to be here! Well, if you don't like biscuits maybe not, but nonetheless it's pretty impressive and I am certain you can find something you'll like. ~Oh my word, my mouth is still watering from the fried green tomato & pimento cheese biscuit I had here. Wow! So delicious. I got a biscuit to go with homemade raspberry jam for the ride home and it hit the spot once I was hungry again hours later...when in Asheville! Like any coffee addict, I was curious to find a good cup after lunch and so we headed over to Penny Cup Coffee Co. Not only is the coffee great, they have this super cool mural along the whole back wall. With my coffee in hand, Abby and I made our way to our next stop, the Antique Tobacco Barn. This is definitely one of those places where one man's (or women's) junk is another's treasure. It is literally thousands of square feet of wall to wall furniture, art, decorations, and any other 'antique-y' thing you can imagine. Couples beware, if you get separated, you will get lost! Needless to say Abby was in heaven decorating her dream home mentally while I did find myself coming up with some pretty cool home office designs, à la Don Draper. ~This place was amazing. There were so many well made antique pieces that I could have taken home with me. I even thought about not including this on our list because I don't want all the good stuff to get taken! Haha. But that's not fair to you, I'll just have hustle back. After a quick dinner at the super popular White Duck Taco, we headed over to the massive and equally picturesque Grove Park Inn for cocktails by the fire. This is one of your typical "Asheville" staples, much like the Biltmore Estate. It is a mammoth resort and spa that is set far enough outside of the city center to give guests a breathtaking view anytime of the day. Just grab a drink and make your way to one of the dozen or so vantage points located throughout the property. ~This resort was amazing and would be great getaway in the winter as the view was incredible and the dozens of fireplaces throughout make the whole aesthetic extra cozy. It was raining during our few hours there and it still was such a memorable view. A trip to Asheville simply would not be complete without spending some time in nature itself. To get that fix over the weekend we first went to the North Carolina Arboretum. This 434 acre public garden offers both manicured and rustic gardens, hiking trails, green lawns, and educational centers. There is no wrong time to go but close to sunrise or sunset would be ideal. Another staple to the whole "Asheville Experience" is hiking the Blue Ridge Mountains. There are countless entrances and it seems you can access a trail by pulling over anywhere along the highway. Regardless of where you choose to hike specifically, the adventure is a must. ~The most "Asheville personality trait" I have is that I really enjoy hiking, but don't get to do it enough. When visiting Brevard in the fall with my college roommates, we went on a death defying hike (literally repelled down a section) into a valley with raging rapids to watch a white water kayaking race. It was amazing and having known how hard it was probably would have chickened out. Austin and I did a less treacherous hike and it was very peaceful. Asheville was a blast and we are so glad we listened to our friends' constant urging and took the plunge to visit. It has so much to offer and such a rich collection of talent and creativity. Throw in some great beer, some tasty food, and some pretty amazing scenery and you have the makings of a great weekend trip. We know we will be back again real soon!